As I discussed in the last "theory and practice" post, the deliberate targeting of innocent bystanders separates terrorist methods from other revolutionary techniques. Terrorism is more than just a choice of tactical methods, however. If you threaten, kidnap, and murder civilians as your preferred approach to overthrowing a regime, you need an argument at the higher levels of strategy that justifies the otherwise unjustifiable—at least in your own mind. Since my whole purpose for writing this blog is to make a small contribution towards the defeat of Al Qaeda and other terrorist groups, I goes without saying that I do not believe that terrorism is justified. It is, however, vital to understand their own thinking, if for no other reason than to make educated guesses at what their next steps may be. The point of terrorism is terror. That statement may sound like a truism, but it's easy to lose track, in the confusion of daily events, what terrorist groups are trying to achieve. Terrorists do not need to inflict casualties at the scale of the 9/11 attacks to generate terror. Sustained violence, in which only a handful of people are affected in each attack, is often sufficient to create a gnawing sense of unease about your own personal safety, mixed with a bleak outlook about the collective future. Creating that state of mind is the first in a chain of events that terrorist hope to initiate. Where it goes from there depends on the terrorist group. For terrorists fighting a foreign power, and therefore targeting that nation's population, the chain of events is relatively simple: make the enemy's citizens so tired of being constantly afraid for life and limb that they compel their government to withdraw. These attacks are also supposed to inspire hope among the occupied that, even in the face of a powerful foe, people can fight back. This, of course, is the strategy of the Al Aksa Martyr's Brigade and Hamas against the Israelis, the IRA campaign against the British, and the Chechen and Irgun terrorists against their Russian occupiers. This strain of terrorism is partisan warfare that has gone down a particularly ugly road, attacking civilians instead of government and military officials, that the French maquis and other WWII partisan groups never took. When there is no foreign occupier, the logic of terrorism becomes a bit more tortured. In these cases, terrorists emphasize the effects of the government's response to terrorist attacks, not the attacks themselves. For example, the Red Army Fraction believed they were forcing the West German government into a general police crackdown. Arbitrary searches, arrests, and surveillance would reveal the state as the monster it truly was, igniting "revolutionary consciousness" among people who otherwise believed the lie that the capitalist state was on their side. Other Marxist terrorist groups, such as the Symbionese Liberation Army, have believed in similar revolutionary timelines. So, too, have non-Marxist groups, such as Aum Shinrikyo, the Japanese "doomsday cult" that released the nerve gas sarin in a crowded Tokyo subway. In Aum Shinrikyo's scenario, the Japanese government, in a panic, would blame foreign governments (probably North Korea or China) for the attack. Since Japan's ally, the United States, would be dragged into the ensuing international crisis, the stage was set for the nuclear apocalypse that Aum Shinrikyo hoped would result. If the governments involved didn't stumble into nuclear war themselves, perhaps another poison gas attack might do the trick. All of these scenarios sound bizarre and convoluted—because they are. Terrorist strategy is born out of a dangerous combination of desperation and grandiosity. In their minds, terrorists face an ultimate foe—an unbeatable foreign occupier, the forces of international capitalism, the earthly manifestation of evil. According to this line of thinking, only the terrorists now stand against this enemy; other groups, following "normal" means, have already failed. The Arab elite failed to stop the Israeli victories in 1967 and 1973. American politicians failed to check the spread of the UN's plans for a new world order. Northern Ireland is still part of Great Britain. Terrorists therefore need a theory of why they stand alone in resistance to the enemy, as well as what justifies the most morally repugnant methods imaginable. While people often use the terms terror, terrorism and terrorist far too loosely, there are occasional parallels sometimes drawn between revolutionary terrorists like Al Qaeda and would-be practitioners of terror within governments. For example, in the 1930s, a small group of military thinkers—most prominently, Italy's General Giulio Duohet—argued that the new weapon of airpower should primarily target the enemy's population. By inspiring fear and hopelessness through terror attacks from the skies, they argued, countries could conclude wars more quickly and successfully than if airpower were used as an adjunct to ground or naval operations. 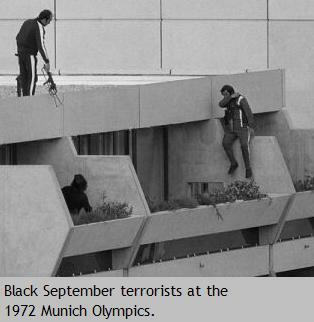 In fact, terrorism has a similar record of failure. In no country have terrorists engineered a mass uprising against the state, or any other chain of events that, according to the terrorists' own thinking, was supposed to lead to a revolution. Terrorists have also fared poorly against foreign occupiers. The Israelis still occupy the Occupied Territories; ETA hasn't compelled Spain to grant the Basques independence; the negotiations over Northern Ireland future happened because of "war weariness," combined with a general disgust with both Catholic and Protestant militants. It's even less surprising, therefore, that terrorists—the ones who truly depend on terrorist tactics—strain to make themselves sound credible. It's also why terrorist groups generally remain small. During an internal shake-up within Al Qaeda before its leadership moved to Afghanistan, the most militant core—the one ready to attack both the "near" and "far" enemies simultaneously—was happy to see its fainter-hearted brethren go. Terrorists may try to justify themselves to outsiders and potential recruits, but they don't tolerate misgivings within their own ranks. If they can't invent a convincing story about ultimate victory, terrorists often fall back on the gesture of defiance as its own justification—regardless of the gesture's consequences. It's another form of anti-politics, in which the act of "doing something" is more important than engineering a political outcome. Terrorists are distinct from other practicioners of political violence, both in their methods and the characteristics of their organizations. Although you couldn't make terrorists go away by ignoring them, you could deny them a victory by muting the volume of terror they generated. A common theme of terrorism scholarship was, Terrorism is a form of political theater. The natural conclusion was, Avoid getting tricked by cheap theatrics. It should be easy to understand, therefore, why people like me believe the Department of Homeland Security's color-coded alert system is counter-productive. So, too, is the sloppy way the Administration uses to describe Al Qaeda as an enemy. Every measure we take to cold-bloodedly dismantle the Al Qaeda network is a victory for the United States. Every bit of terror that gets amplified is a tactical or operational victory for them. Ultimately, Al Qaeda may not ever defeat either the "near" or "far" enemy. Meanwhile, we shouldn't be abetting their smaller-scale successes. Terrorists also have a fair record of success of course; but a victor is rarely remmebered as a terrorist. Micheal Collins’ IRA in 1917 was certainly operating as a modern terrorist group. 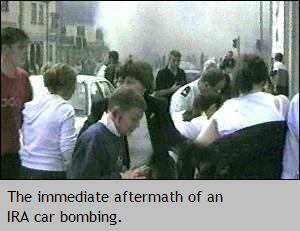 Like Gerry Adams’ PIRA in the 1970s its primary targets were the security forces but they also killed non-combatents and had a wide ranging defination of collaborator that covered much of the population. Collins also came to table short of his goal of a united Ireland. Had a World War been going on Adams might have achieved more than becoming the second most powerful politician in N.Ireland. An interesting example that I need to chew on a bit. Good post for reflection, especially given the London subway bombing. Aw, crap. Thanks for the catch. I'll fix the error. Irgun terrorists did not fight against Russian occupiers. From its founding in 1931 until its dissolution in 1948, Irgun fought Arabs and the British in the Mandate of Palestine. Civilization is based on a clearly defined and widely accepted yet often unarticulated hierarchy. Violence done by those higher on the hierarchy to those lower is nearly always invisible, that is, unnoticed. When it is noticed, it is fully rationalized. Violence done by those lower on the hierarchy to those higher is unthinkable, and when it does occur is regarded with shock, horror, and the fetishization of the victims. The company is making this voluntary recall of products because testing at timberland chukka shoes online the company's farm showed some of the eggs may contain the bacteria. Consumers should return the eggs in the timberland boat shoes original carton to the store where they were purchased for a full refund. This weekend I have watched Ledeen, Ferguson, and Robert Kagan totally shredded as imbeciles and psychos. But these guys know more about these issues, in theory and experience, than I ever will. I am willing to accept the shredding, because I am sympathetic to the shredders. I agree with them, in my ignorance. But forgive me if I become just a little skeptical of authority in general. Knowledge sure hasn't helped Ledeen or Victor Hansen. This ain't intelligent design, and deciding whom to trust isn't so simple. I cite A & I constantly as an authority on counter-insurgency, but for all I know...never mind. I just don't know how ro judge. In the third, air jordan retro 1 I think that Wesley Clark’s recent analysis of how America defeated the Soviet Union is on the mark,and that we will have to continue to push the contradictions on the various parties that are still entranced by the Marxist fallacies.air jordan 3 This requires engagement with Russia and the former Warsaw pact nations to keep Russia on track and to try to minimize backsliding in parts of the old SU. newest air jordans We need to work China off against North Korea, and we will at some point need to deal with Castro and his few remaining Western friends. nike basketball shoes This requires engagement with Russia and the former Warsaw pact nations to keep Russia on track and to try to minimize backsliding in parts of the old SU. newest air jordans We need to work China off against North Korea, and we will at some point need to deal with Castro and his few remaining Western friends newest air jordans .